It was a tremendous amount of work and expense to get to the South Pacific. We've reached the goal for which we've worked for a long time. There is a lot to see in this magical part of the world. Although we would have liked to keep Wings in French Polynesia, we've run afoul of the Polynesian law about how long one may keep a vessel in the country: 18 months only, and the penalty is a tax of 30% of the boat's value. We cannot keep her there throughout the next layover so she must be out of French Polynesia prior to our leaving at the end of this leg. We'll take her out of French Polynesia, through the Cook Islands, Niue , Tonga, and then Fiji where we've made arrangements to store her in one of the keel holes for which they are famous. We have crew, too! Our friend, Nathan Zeigler, engineer and sailor, will join us for a week in French Polynesia, sail with us to the Cook Islands, and leave us on Rarotonga. As far as we are now aware, the diesel injectors have been replaced, the starter and solenoid have been replaced, and the heat exchanger has been replaced, all by the staff at Raiatea Carenage. We have also had the rigging tuned and the mast wedges replaced. The list is long but all was necessary. All cruisers are hesitant to have anyone but themselves work on their boats, but we decided that we didn't wish to spend weeks of our time working on the boat. That's not to say that we won't use every second of the week that we have scheduled to prepare the boat! As it turned out, the work had NOT been performed as we had been led to believe and we spent two weeks frantically completing work that we thought had been completed earlier. It was not fun! We were pressed for time to fetch our shipmate, Nate, from Tahiti, so pushed very hard and managed to overcome most, but not all, of the problems that appeared. Our trip from Raiatea to Tahiti was uneventful but exhausting after the long weeks of work. We fetched Nate and sailed back to Bora Bora. 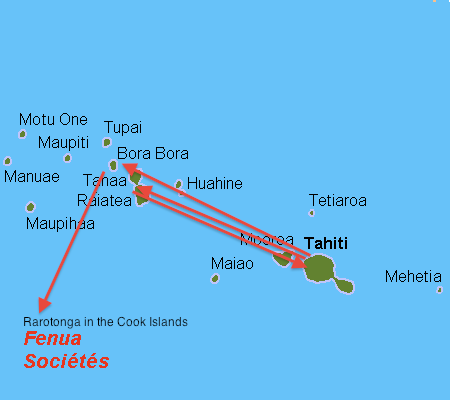 From there, we sailed to Rarotonga, Cook Islands. From Rarotonga, where Nate left us, we sailed to tiny Niue, then to Vava'u, Tonga, and on to Vuda Point Marina in Fiji. Conni has created a marvelous passage to Fiji. We plan on sailing through the Lakeba Passage, spending the night anchored in the lee of Lakeba. We'll day-sail to Gau, again spending the night anchored in the lee of the island, then sail on to the main island in the group Viti Lavu. Nadi is the site of the internation airport from which we'll be leaving and on the north side of that bay is Vuda Point, Marina (http://www.vudamarina.com.fj/) where we'll store the boat.